Any how, the company has not funded these accounts properly. The company pledged to fund my HSA evenly though out the year and has failed to do so. I try to contact the home office and get stonewalled, any reply is achieved by getting my supervisors to send e-mails to them. They put random amounts in the account when you complain and send you an e-mail saying the fund is correct. Actually, I've got it good, because my co workers with the FSA have funds deducted from their paycheck and not posted to their account. I have contacted the Federal Wage board and other than one message on my answering machine,( telling me to contact her, and all other follow up calls have met voice mail purgatory).My question is, what means of redress do I have? Thanks, I do enjoy your blog. Oh dear, you are in a pickle. First, let's define a few things. HSAs are Health Savings Accounts. They are designed to allow you to pay for medical costs tax free. Individuals or employees can contribute to them. I'm a big fan (although I've never personally used one, but I think I'd be a fan.) An FSA is a Flexible Spending Account. These have a big difference from the HSA in that they are use it or lose it accounts. If you put $1000 in and then only have $500 worth of eligible costs, you lose that $500. Now, on to your question. Your employer is about to get themselves in a whole heap of trouble. The IRS regulates Flexible Spending Accounts. They are definitely known for their warm fuzziness and understanding of mistakes, right? The way to get things fixed internally is to get the right person upset about it. Your e-mails go unnoticed, but your supervisor's e-mails get responses. Can you get your supervisor to get her boss to complain? The higher up the complainer is the more likely you are to get a response. You might want to throw in the words, "you know, the IRS regulates this." It might help. Unfortunately, I'm not a benefits expert, but B. Janell Grenier is. Hop on over to her blog and see if she can give you a better answer. Thank you for bringing this matter to our attention. We immediately launched an investigation and this is what we determined regarding . [Mexican Restaurant] admits that their children's menu does not include macaroni and cheese or chicken nuggets. They claim that it is their choice to serve "Mexican" food only. We say this causes a disparate impact, as noted by the lack of toddlers in the restaurant. We also questioned them as to why they thought that it was sufficient to only serve "Mexican" food. What about the rest of Latin America? The investigation over whether Guatamalens are harmed by this is still underway. [Mexican Restaurant] acknowledges that the person working the counter was female. This clearly attracts males--and not only males, but heterosexual males. While at the present, we don't monitor the sexual orientation of people (but we are thinking about it), this is a concern to us. [Mexican Restaurant] admits to serving "spicy" foods. They also acknowledge that men tend to prefer spicy foods more than women do. They also admit that pregnant or nursing women may have to stay away from spicy food due to heartburn and upset babies. Again, they claim this is an untintentional slight, but we are still concerned. We thank you for bringing this to our attention. We will be working with [Mexican Restaurant] to bring them into compliance on this very important issue. *Everything past here is made up. And the food was great, by they way. He gives me free legal advice. I give him free HR advice. It's all good. Boss: The outsourcing needs to be seamless in order for you to meet your goal. Boss: The client will not experience any change in service. They will not know that this task has been outsourced. EHL: No, that is not a goal I'll accept. Boss: Well, you need to make it happen. EHL: I have no authority over the outsource company. They don't report to me. I don't have hire/fire authority over the person they assign to the task. You want me to be responsible for something I have no authority over. Boss: How about your goal is to "provide the outsourcer with all necessary information to complete the task." Ahh, the responsibility vs. authority problem. It's a big one we face in HR. We're responsible to make good hires, reduce turnover, fill the leadership pipeline, make the EEO and OFCCP happy and solve every problem under the sun. But, do we have the authority to do so? Some HR people might. But, who makes the final decision on who to hire? The Staffing Rep? Not likely. Staffing can send a variety of candidates, but it's the manager who makes the hiring decision. What about managers? Internal promotion decisions are made by current management. Sure, HR can have input, but the final decision? Line management. We can offer management training classes out the wazoo, but we are dependent upon line management to get their employees in the classes. But, who is held responsible for all these things? HR. It really annoys me. If you are going to make me responsible, give me authority. Kris at the HR Capitalist has the subitle : Get to the table, stay at the table. He's a wise man. Being at the table helps give you authority to accomplish the things you are already responsible for. Tribal wisdom of the Dakota Indians (so legend has it), passed on from generation to generation, says that, "When you discover that you are riding a dead horse, the best strategy is to dismount." 3. Giving horse and rider a good bollocking. 4. Re-structuring the dead horse's reward scale to contain a performance-related element. 5. Suspending the horse's access to the executive grassy meadow until performance targets are met. 6. Making the horse work late shifts and weekends. 7. Scrutising and clawing back a percentage of the horse's past 12 months expenses payments. 8. Appointing a committee to study the horse. 9. Arranging to visit other countries to see how other cultures ride horses. 10. Convening a dead horse productivity improvement workshop. 11. Lowering the standards so that dead horses can be included. 12. Reclassifying the dead horse as living-impaired. 13. Hiring outside contractors to ride the dead horse. 14. Outsourcing the management of the dead horse. 15. Harnessing several dead horses together to increase speed. 16. Providing additional funding and/or training to increase dead horse's performance. 17. Doing a productivity study to see if lighter riders would improve the dead horse's performance. 18. Declaring that as the dead horse does not have to be fed, it is less costly, carries lower overhead and therefore contributes substantially more to the bottom line of the economy than do some other horses. How sad is it that I not only laughed, but nodded my head with almost every one of these? The Carnival of the Insanities is up over at Dr. Sanity's place. You'll learn about Iran, Piano playing, political ads, mad kittens and flying children. What more could you ask for! We always hear about "thinking outside the box." But what if that thinking leads us to hiring outside the box? With the scandal at Walter Reed Medical Center the Army Surgeon General Resigned. The interim Surgeon General? Major General Gale S. Pollock. What is so outside the box on this hire? She's not a doctor. She's a nurse. Granted, she's an interim Surgeon General, but I still think it's got great potential. The Army definitely has problems with it's medical centers. Maybe the best way to fix it is to think differently--bring in a nurse who has different experiences and view points than doctors do. [N]urses are notorious for creativeness under fire, frugality, patient advocacy and stepping up to the plate when the odds are enormous. Nurses have brains, intestinal fortitude and can-do attitudes. General Pollock is an able leader, and she is now quite possibly the most publicly visible nurse in the U.S.
Have there been "out of the box" hires that you've seen? Did they work out wonderfully or fail miserably, or somewhere in the middle? Toddlers are taking over Manhattan, apparently. And not just any toddlers--the rich, white kind. I could live on $284,208 per year, couldn't you? I even have a toddler (although she will insist she is not a toddler, she is a pre-school girl). If stumbled upon this article right after chatting with two of my colleagues about our children. While none of us have salaries that push us into that $284,208 bracket (although no telling what their husband's make--so maybe they do), we all have young children and are much older than our mothers were when they had young children. It's expensive to live in Manhattan. And unless you just completed your Supreme Court Clerkship, you're not going to be making that kind of money by the time you are 25. You're going to be an older parent. So, these parents are older, and have devoted time to their careers first. Is this good for business? Would it be better for a business to hire people who had their children in their early 20s, so time off for stomach viruses and school plays was taken by the low level staff instead of the executive group? In requiring extra hours that make people feel unable to produce their own offspring at young ages causing companies to lose money in the long run? Maybe the old way of getting married young, having children young, and getting them out of the house while you are still young was better for business. Thoughts? I'm a day late, but part of the fun of a carnival is the anticipation, right? Right. We didn't have a planned theme, but it turns out one developed all on its own: Managers need help. Do you see or measure each action or non-action as a sign of disrespect or disloyalty? The amount of CEO compensation was not an issue when I was starting out in business. You knew that the CEO would make good money, but that was part of the game. And, besides, the CEO didn't make all that much more than anybody else. That's changed. But if you wanted to fire a bad manager or an overpaid CEO--or hire a new one, we'd turn to Deb who discusses "hiring & firing speeds." then again, hiring slow and not letting managers get away with firing 'that day' without doing their homework first, can suddenly turn into an "HR is not supportive or responsive" riot. this means we have to communicate a lot with our managers, and often need to take the time to train/coach managers through the process. Anna at The Engaging Brand tells us about a manager that had a Homer Simpson experience and his new employee played Bart. And to round us out, Evil HR Lady answers a question about a manager that just won't let his old employee go--much to the detriment of the new employee. You shouldn't date mama's boys, and, in this case, you shouldn't work for them. So, now we know--managers need help. If they would just read our blogs, businesses would have no problems. Wonderful submissions! Fabulous posts. Next Carnival in two weeks--April 4. Any HR or Business related posts are welcome. Submit to evilhrlady at hotmail.com. Okay, this post is about being a slacker. Or, more specifically, I am a slacker. So, think of this as your opportunity to submit more posts. Anything business/HR related is acceptable--as long as there are no bad words. My daughter's mother reads this blog and we don't want to offend her. Send your hr/business related posts to evilhrlady at hotmail dot com and they will be posted in the late Carnival. I promise I will do it when I get home. I'm conducting a training session today and in my class is the new training manager, so I'm a bit nervous. Never met him, but my job share partner says he's a nice guy. I don't know what happened to my picture yesterday. I'm trying again---because it really is a funny picture. Poor Offspring. I have a question. I was called in to interview for a position as Office Manager and offered the job. (I had previously worked at this office years ago and they contacted me.) The office manager at the time was going to semi retire for a year (work one day a week) and then retired. She is still here 3 years later. The office is her “place to go and talk” each week. The managing partners defer to her on all personal and personnel matters. She is a very nice person, but she consistently talks, disrupts the office and must be taught how to do a job that she was doing for 16 years. Today was her work day. She talked all day. I tried to ignore her and be polite. The tension showed on my face. My boss asked me what was wrong. I mentioned that it was difficult to get work done sometimes when this particular person is around. I was told to get over it. How do I deal with this? I’m clearly not being taken seriously or given the same respect. Please help. I hate to be the one to break it to you, but you're going to either have to "deal" with it or find a new job. My guess is that the old (ha!) office manager took on a mother-type role and that your boss is a mama's boy. Now, if the other 4 days a week everything is fine, then you can probably endure her once a week visit. Plan for a day when you will not be productive at all, and try to just let it slide off you. If the 4 days she's not there involve people saying, "let's wait until Marge comes in before we make that decision" then your life is much more difficult. Since the managing partners defer to her on important decisions, I think your life is very difficult. You've expressed your feelings and been told to get over it. Unfortunately, you're going to have to do this. I think your best option is to get over it by getting a new job. Ironically, that may be the only thing that wakes everyone up to the negative impact the retired office manager is having. I'm sorry I don't have a set of magic words for you. If you decide the job is worth the pain, have a sit down talk with your problem. Explain that you find it difficult to do your job, since everyone defers to her. If she's truly nice, she may back off. Good luck, and of course, if any of my readers have suggestions, please let this new office manager know. Ummm, let's see. Because, perhaps, maybe, there is a cause and effect relationship going on here. If I spend more time working then I make more money. Hmmm, is that possible? Let's try the reverse. If I spend more time goofing off, then I make less money. I fail to see the mystery part of this. Perhaps if I used the time I spend blogging doing work, I'd be rich! An applicant applied for a job that we had posted and we did not screen her in for an interview because we know that she was fired from her previous position for lack of attendance due to a drinking and drug problem. (I am from a very small town and news travels fast) I sent her a letter stating that we did not screen her in for an interview but thank you for your interest with the organization. (Policy rules to inform everyone) She has now called me and wants to know why she didn’t get screened in for an interview. I have never had this happen in all my years of working in HR. Weird. Normally this is way easier to respond as they were clearly not qualified for the job. What do I say and how do I say it. Is there a reason you have to respond? Yes, I admit, that is my wimpy side coming through. (As a child I assumed that adults were never scared or nervous and they never did anything they didn't want to. I thought my mom liked doing dishes. Boy, life has been a rude awakening!) Sorry, I tend to be too stream-of-conscious. I don't have a good answer for you. But I'm going to bump this to my online HR pals and see if we can get them to come over and give you a great answer. Kris, Deb, Lisa, Patrick or anybody else? My desire would be to say, "We know you were fired for x,y, and z at your last job. This is why we didn't interview you," but I suspect that is not a good answer. I hope everyone responds. And I hope you still like my blog, even after I gave you a non-answer. Just kidding, although food is nice. Penelope Trunk at the Brazen Careerist, posted a video blog by Bruce Tulgan regarding employee requests. He tells a fabulous story about an absurd request for different cubicle furniture. Why is that our first reaction when someone asks for something extraordinary is "no"? Because it's never been done before? Because I'm the manager, dang it, and I'll decide what goes on here? Because I don't want something like that, therefore, this person can't possibly want something like that, therefore they are just pushing my buttons? Practice saying this instead, "I don't see any reason why not. Let me think on it over night just in case there are unseen problems and we'll see what we can do." Of course, if the request is illegal or cause department strife, you, as the manager, do have to say no. But if it's cost neutral and won't bother anybody else, why not? There, is that so hard? Only one week until our next fabulous HR Carnival. Send your submissions to evilhrlady at hotmail dot com! Another blogger posted his thoughts about people who consider their employment a profession verses those who think of it as a job. He got pretty seriously blasted and ended up deleting the post (just when I was planning to link to it, curse him!). To respect his decision, I won't link to his blog, but I do have some things to say about it. I do see myself as having a profession. However, at this point in my life, I'm not willing to work full time. I'm not willing to stay until 2:00 a.m. to solve a problem. I'm in HR people, it's not brain surgery and no one is going to die if headcount isn't done until the next day. That being said, I'm also an efficient worker who tends to be able to use my computer skills to automate tasks that previous people have spent hours and hours per performing. Some people in my department have differing views. They are willing to stay until 2:00 a.m. and are unwilling to say no to senior management, regardless of the absurdity of the request. That would seem to shout "this person is dedicated to the profession!" They aren't necessarily willing to find a faster way to do the job. HR is female heavy and my department is no exception. There are 23 people in my department, 20 of whom are women. Of those 20 women, 16 have young children, and one of the childless ones is pregnant with her first. For all 16 of those, the mom is primarily responsible for childcare. Every single one. If the kid is sick, mom stays home. Now, keep in mind that this group has those people described above who are willing to stay until the middle of the night working on a project that will not save the world. They are dedicated. Some feel this is their calling. Yet, even among those who make substantially more money than their husbands (I know way too much about my co-workers lives), they are still the primary care givers. So, at which point do we judge someone's dedication to their job? By the number of times they can't come into the office because family responsibilities take precedence? By the number of times they stay late at the office? By the number of times they work from home after the children are asleep? I advocate for throwing all of those criteria out the window. We should look at the end product: What are they producing? We give credit for face time. Why? 90% of my work is done via e-mail and phone calls. My function supports all of our US and Puerto Rico sites. I couldn't have face time at each of those sites even if I wanted to. So, why does it matter if I show my face every day at the office? It shouldn't. Should it matter if it takes me 8 hours or 6 hours to accomplish a task? I'm an exempt employee (no over time), so theoretically I'm hired to do a job, not punch a clock. And to give credit where credit is due, my female heavy department is fabulously flexible. They do still reward face time (especially face time where you are in your manager's office rather than your own accomplishing something--which I don't understand at all), but understand that while this is a profession, it's not a life. Harvard is doubling the available money to pay doctors who teach. I would have thought they were making enough money as is, but it turns out that even for doctors, teaching is not terribly lucrative. For someone not only with a medical degree, but qualified to teach at a Harvard affliated hospital, that's nothing. You are going to attract very few people with that amount of money. Apparently, doctors who teach aren't the only prestigious group to be underpaid. Federal judges are as well. Granted, I'm not crying buckets tears for the Supreme Court Justices, who make around $200,000 year, but I would be crying if I were them. Their former clerks are getting that much in sign on bonuses. Well, Justice Kennedy, here's an option for you: resign! I'm sure you can make a lot more than some young associate working for a firm specializing in Supreme Court litigation, or, for that matter, as an arbitrator. Indeed, I'd speculate that you could easily make 3 or 4 million dollars a year! What, you don't want to give up the power and prestige that comes with being a Supreme Court Justice? Than maybe there is NOTHING wrong with current salaries, at least at the Supreme Court level. Indeed, I'd guess that none of the the Justices would resign even if they had to take, say, a (n unconstitutional) 25% percent pay cut. But, lower court judges don't have all the power and prestige that a Supreme Court Justice has. This means that the available pool of talent for such jobs necessarily excludes very qualified people who have mortgages and kids in college. I'm very much in favor of smaller government and think most programs should be gutted. However, I also believe that good judges are necessary for a strong country. By not paying enough, we're not getting the best. I hope that Congress takes some advice from the folks over at Harvard and doubles the salaries of our federal judges. But, I couldn't trust them to do so without doubling their own salaries. And lets face it, that's a bunch of people who do not deserve a raise of any sort. The Carnival of the Insanities is up over at Dr. Sanity's place. Hop on over and take a look. The Evil Family went out for dinner tonight at a chain restaurant. We don't frequent chains because the food tends to be mediocre and the service bad, but we were on our way home from skiing and we needed to eat before the Offspring fell asleep. So, a chain it was. The diners on either side of us had problems with their meals. Diner A's steak was not cooked right. Diner B ordered a chicken burrito and received a bean burrito. Neither was the end of the world and both diners were very polite as they explained this to their (different) waitresses. Here is what happened with Diner B.
Diner B (very pleasantly): Excuse me, I ordered the chicken burrito and there is no chicken in it. It's just beans. Waitress: Oh. Let me get the manager. Waitress runs off and finds manager. This takes several minutes. Manager comes over and is looking completely frazzled (although her hair is still perfect--I should ask her what she uses in it). Diner B (slight edge to her voice): This is a bean burrito. It's supposed to be chicken. Manager: (Leans over table and peers into half eaten burrito.) Oh, okay. We'll get you another one. Now, this ended just fine, although the customer was more annoyed than she would have been had the waitress been empowered to fix the problem herself. Wally in last week's carnival, gave us some ideas of why we have problem managers. And as a sneak preview for the upcoming carnival, Lisa tells us more about the problems of poor management. I personally hate the "empowered" word, but that was what needed to happen. Here is what should have happened. Waitress: I'm so sorry. I'll get a chicken one made for you immediately. I do apologize. Now, because it was a chain restaurant, I don't know if the manager was empowered to delegate the ability to fix kitchen errors to the wait staff. She should have been. She was running around like crazy, fixing things that could have been fixed by others. We don't train our managers correctly. We don't teach them what they, as the manager, should fix and what their employees should fix. Managers are scared to let employees have any power--for fear they'll make the wrong decision. If your employees are poor decision makers, you should not have hired them in the first place. Hire good employees and let them do their work. And get that poor lady a chicken burrito. She's been waiting for it. Help me out here, I think I may be missing something. When I send an e-mail asking Steve a question and I cc Bob and Jane, it's because Bob and Jane need to know the answer as well. So, when Steve replies just to me, I have to forward the answer to Bob and Jane. Then Jane will reply, just to me, and I have to forward to Steve and Bob. I understand that some people cc the entire world on every e-mail, but I don't. If someone's name is on there, they need to know the information. Am I the only person who does this? Yesterday, I spent all day playing messenger girl between Steve and Jane. Technically, I didn't need to be in the conversation--I just needed to know the consensus at the end. But neither one would e-mail the other. Just me. Someone explain this to me. Oh, and I believe this little bit of information makes a difference: Steve, Bob and Jane are all lawyers. Daniel Radcliff, better known as the boy who plays Harry Potter, is proving to the world that he is a "serious actor." Ahh, yes, I now take him much more seriously. Don't you? I really don't understand why taking off your clothes is supposed to be this big career helping move in the acting world. Why? Is it difficult? I don't think so. I take off my clothes every day--sometimes twice. And if I'm shopping for new clothes, I even take on and off several outfits in a matter of minutes. I should be on Broadway! Will it help Daniel Radcliff's career? I have no idea. It won't help yours, though. That whole line about "no such thing as bad publicity" is not true. Really. Make a fool of yourself in public and your current or future employer is bound to find out about it. They will not be pleased. Especially if the article says: "Jane Doe, who works as a Sr. Financial Analyst for Big Company, is currently staring in the Naked Wizard of Oz. 'You have to worry about sitting on the straw that falls out of the Scarcrow's costume' Jane said, laughingly." You go to carnivals at night, right? So, it's acceptable that I'm not posting this until 8:00 at night. Don't say otherwise or I won't host another carnival for two weeks. Or say otherwise and I won't host another carnival for two weeks. Next carnival is Wednesday, March 21--the first day of Spring! And so welcome to the festivities! we tend to be great at the continuous improvement part. start a new program, start problem solving with a vengence, and make grand strides. but toyota spends a lot of time and effort on people. they don't just talk about people being their greatest asset. they invest in training programs for all of their employees, extensively developing their skills, building teams, developing future leaders, and even provide training and support to their suppliers. Reason number one. We promote the wrong people. Reason number two that we have so many managers doing lousy management work is that managers get little to no training in how to be good managers. Reason number three that we have so many managers doing lousy management work is that we think you learn leadership and supervisory skills from a book or a class. It sounds like if Deb and Wally got together they could take over the world. I'll just take a finders fee for suggesting it. While a quick Google of the web will bring up lots of examples of people claiming they got fired for blogging, the truth is that people dont get fired for blogging; they get fired for what they blog! Now, let me put my HR Wizard hat on - If your company has a policy about blogging, follow it! I know that sounds terribly HRish of me, but believe me - even if the blogging policy is a rag and infringes on your first ammendment rights, you are better off to swallow hard and live with it, because while the ACLU might defend you if you get canned, they won't pay your rent while you are between jobs! In fact, I'll stake my HR secret decoder ring that you won't be fired for blogging about your hobbies (PG-13 or better), your cat, or even something as potentially tricky as management IF you leave out questionable, objectionable, or confidential information. But if you go off on a blog-rant about what an idiot your boss is, the ingredients for your company's new "secret sauce", or how you and the VP of Sales are shaggging..... you will end up on the bad end of the situation - start practicing this pharse in prep for your next job - "Would you like fries with that?" And speaking of French Fries, they are not healthy. And unhealthy employees are bad for your business. Kris at HR Capitalist tells us about the future of business provided healthcare. Ha! Now I have you interested and you'll have to go check Kris out. 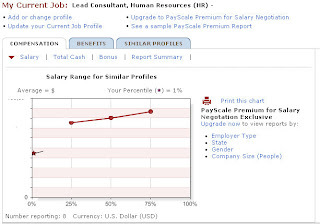 I went to Payscale.com and had my salary evaluated. You put in your title and it asks questions about your company size, what titles are comparable, your benefits and education, along with your current salary. Then it comes back with a salary range for your job along with where you sit. Now, go forth and develope your employees and write great posts for the next carnival! And send those posts to evilhrlady at hotmail dot com. And if any of you HR blogging types are interested in hosting, let me know! I'm always willing to spread the joy around. I found a site to ruin what self esteem you have. Things Other People Accomplished When They Were Your Age. Francis Scott Key, after witnessing the bombardment of Fort McHenry, publishes "The Star Spangled Banner." Judith Guest began writing her first novel, Ordinary People. After defeating Antony and Cleopatra's forces in a naval battle, Augustus became the master of the Roman world. Matthias Jakob Schleiden, a German botanist, formulated the cell theory of physiology. Go in and put your age in. I dare you. See, that little dot on the bottom at the left? That's my salary compared to what I should be making. I need a raise! It works by taking information from you and then putting it all together to spit back out to someone else. The more people that use it, the better off you are. The one flaw was that while it asked how many hours you work (I work 20), it didn't calculate my full time equivalent salary (which would have been easy--salary*2). So, on my final chart, it showed me way at the bottom. If you truly do calculate the total salary of my job share partner and me, we're making more than anybody else who has written in. How on earth can I whine about my salary now? Truth be told, I'm not sure how good a fit the job title I have listed is with what I really do. I've never met anyone else in all of HR that does what we do. And we have skills that are difficult to find and super-de-duper critical to our responsibilities. Hmmm, maybe I am underpaid after all. This post is just for the ladies, and it's a little ranty, so bear with me. When you get married, I don't care if you decide to take your husband's name, or keep your maiden name, or hyphenate. I don't even care if you decide to come up with something new altogether. I also don't care what you do with that name when you get divorced. See, I don't care if your name is Jane Doe or Jane Smith or Jane Smith-Doe or Jane Doe-Smith or Jane Smithdoe. I just don't care. But please, pick one and stick with it. I am tired of getting screamed at by women who take their husband's last name legally and keep their maiden name professionally and want their tax forms to show up in their legal name (Hubby's!) but their interoffice mail to their maiden names. We are a Fortune 500 Company. This means there are more than 12 people in this company. I don't know all of you. Names are spit out of the system. If you were going to have such an issue with this, you should have stood up to your husband and kept your maiden name. Now, if you are nice about it, I'll be understanding, but the name that spits out of the system and shows up in reports is still going to be your legal name. Yes, I heard your suggestion to add another field to accommodate you. Ain't gonna happen. So, it's winter. Winter means dirty snow on your shoes. This turns into dirty water on my kitchen floor. I've been blaming my dirty floor on the snow. Then I decided I better update my blogroll with the blogs that I read. (Look to the right!) So, I did. And I had to stop because I was starting to realize that the real reason my kitchen floor needs mopping is that I spend far too much time reading blogs. Of course, what I really should have put is disneyworld.com because we're going there in a few weeks and we're still making decisions about where to stay and what to do. Suggestions are welcome. Two adults, one 3 year old princess loving offspring.